By baking brown rice instead of steaming it on the stove, the risk of over or undercooking disappears - in this version, Vanns Curry Powder and a few simple vegetables add flavor and texture. Brown rice may have a reputation as being healthy, but it also has a reputation as being hard to cook. The stovetop method can often yield rice that's too chewy, too mushy, too watery, or just straight-up burnt. Baking the rice in a covered pan removes some of that difficulty, and gives you the chance to infuse some flavor throughout the cooking process as well. 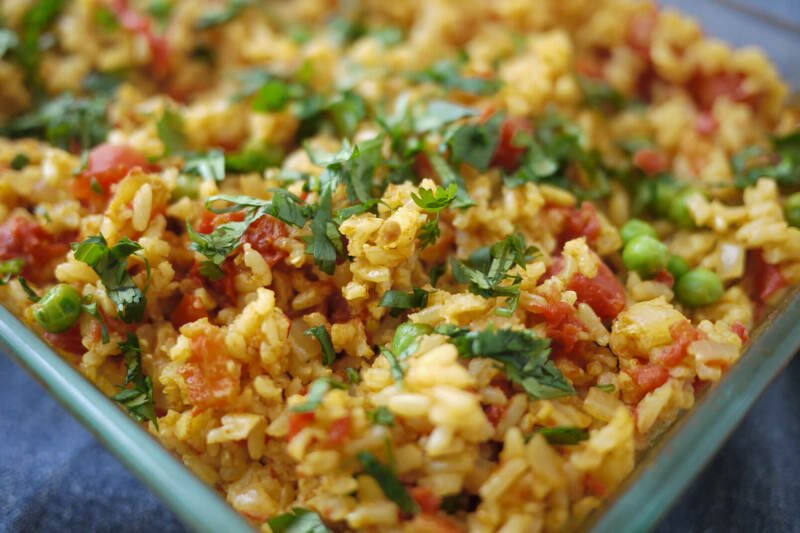 This version uses Vanns Curry Powder to add a light curry flavor to the rice, and the addition of onion, garlic, ginger, diced tomatoes, and peas completes the dish. Serve as a side dish with some grilled meat or fish, or as a main with a fried egg and some garlicky yogurt sauce on top! Preheat the oven to 375°F. Spread the dry brown rice evenly over the bottom of an 8-inch square baking dish. Melt the butter in a medium skillet over medium heat. When foam subsides, add the minced onion and 1/4 tsp. Kosher Salt and cook until translucent, around 3-5 minutes. Stir in the minced garlic, minced ginger, and curry powder, and cook until fragrant, about 1 minute. Stir in the diced tomatoes and cook until heated through, 2-3 more minutes. Set the mixture aside. Pour drained tomato juices into a liquid measuring cup and add water to reach 2 1/3 cups of liquid. Pour liquid into a small saucepan and add 1/4 tsp. Kosher Salt. Bring to a boil, covered. As soon as the liquid is boiling, pour it over the rice in the baking dish, and then stir in the tomato mixture. Spread the rice mixture evenly over the bottom of the dish and cover tightly with 2 layers of aluminum foil. Bake in the oven for 70 minutes. Remove dish from oven and remove aluminum foil. Fluff the rice with a fork, stir 1/2 cup thawed peas into the rice and then cover with a kitchen towel. Let stand for 5 minutes, uncover, and let stand for 5 more minutes. Sprinkle with cilantro leaves and serve immediately. Serves 6. Adapted from The Cook’s Illustrated Cookbook. A curried twist on the classic Shepherd's Pie, with sweet potatoes taking the place of mashed white potatoes on top. A silky smooth butternut squash soup spiced up with Vanns Mild Curry. A lighter take on cream of broccoli soup, with a topping of spiced, roasted pepitas that heightens the toasty flavor of the roasted broccoli.